Activists saved 65 acres of land in Amherst and 45 acres in Belchertown, Massachusetts. Belchertown borders Amherst. Protecting land from development is one of the best ways to stop climate change, which the world's leading scientists say is a major threat to earth's ability to support human life. Most of the money for protecting land comes from the government; politicians decide how much to invest in saving land, versus tax breaks for billionaires, war, and prison for non-violent people. The 110 acres were saved with the help of a group that has a web site at www.KestrelTrust.org. The two deals were done last month. In related news, in Brattleboro on June 7, the selectboard voted unanimously to apply for federal government funding to buy 12 acres of land to protect it from development. The land is at 250 Birge Street. A group that is working to make this deal happen has a web site at www.VermontRiverConservancy.org. 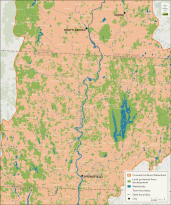 A map of the Connecticut River watershed in Massachusetts, southeast Vermont and southwest New Hampshire shows that the vast majority of the farmland and forestland is vulnerable to being converted to houses, roads, parking lots, and Walmart stores and similar commercial buildings. The map was current as of 2015. In the Valley, land trusts have protected much of the land that is safe from development. Links to local land trusts are at www.FindALandTrust.org.